One of our early members, and considered by most as our crown jewel, is Grace Collins. She was raised in Paradise and followed in her mother’s footsteps into the teaching profession. She knows our local history because she and her family lived it, or she probably taught the people who were building our community. 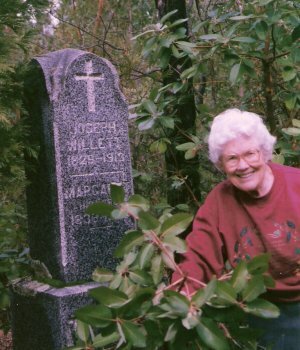 Grace has spent a good part of her lifetime documenting the cemeteries of Butte County. She has logged countless interviews with local families, and she has worn out plenty of shoes from days roaming the fields and foothills for family plots. Grace has had many volunteers to help her along the way, but her guidance and perseverance made it all happen. Her work has been used by local historians for years. Our Society feels blessed by the revenue from her cemetery books. She has graciously shared this index to her 12 “Sites & Cemeteries” books which include most of the outlying areas of Butte County. The larger cemeteries of Chico, Oroville, Paradise, Cherokee and Magalia are not included in this index but are still available for purchase from our Society Publications list or our volunteers will do lookups for a $5.00 donation. Master Index to Grave Stone Photos.